This is a beautiful well-appointed home that was meticulously cleaned and outfitted. We enjoyed it thoroughly. We had wonderful weather and Short Walks easily accommodated our entire family from 12-85years.. Excellent amenities. Great Tv and family loved the ping pong. This property is beautiful; have everything you will need. The beds are super comfortable, gorgeous decoration, lots of natural light. Plenty beach and bathroom towels. The house is close to the supermarket and the main street. Love this property and definitely we will be renting this place again. Large, bright central space....nice and open. Great for eleven people. We will be back! Danielle was very helpful at booking time as well as upon arriving when I needed assistance. I never felt like I was putting her out by calling for something. While the house was pretty well stocked, we felt the kitchen items could use some updating - more smaller/med juice glasses - Ikea has tons of this stuff for low prices. Also new spatulas, whisks, other basic tools. Coffee grinder would be a great addition! A simple set of basic wine glasses. The comforters upstairs were pretty dated and drab looking. The website photos showed nice, newer colorful bedding like what is on the master bed. A few games and dvds would also be a plus. Oh, one thing we noticed - keep an eye on the stability of the upper loft railing, it seems a little weak and unstable, and could stand some reinforcing. 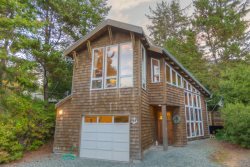 Rain or Shine is the perfect beach house in Manzanita. It is close to everything and provides all the comforts of home. I can't wait to return next summer and enjoy this beautiful house again. We really enjoyed our stay there. We were so comfortable in the house and it is really well planned out with a huge kitchen, large living area with plenty of seating and spacious bedrooms. The house was really clean, perfect location to town and just a short walk to the beach. We will definitely be coming back to Rain or Shine next summer for our vacation. I would highly recommend this place. Manzanita Beach Getaway Vacation Rentals has been great to work with. We have rented through them for the past 3 years and have found them helpful, friendly and accommodating. The 2 places we have rented have been in great shape and are well-equipped. Beds are comfortable. The house was breathtaking. It is located up on a hill overlooking the forest and ocean. The house is comfortable and beautiful. It was a delight to return home everyday and we were sad to leave it! the staff was great on helping us find the best place for our needs. we have spent 4 years coming to the coast, various locations, twice in this town, but this was by far the best we have had. The team was friendly and helpful and communicated well sending us all of the necessary information timely. The house was perfect for our family reunion with children from Ohio, Colorado and New Jersey. The house had all of the amenities needed and was nicely arranged.. We especially appreciated the en suite bathrooms and the extra bathroom near the laundry room. The fenced front yard with the porch was great and the garage with a ping pong table and sand toys and bikes was a bonus. There was easy access to the beach and the main street and a little park with a sand play area for the grandchildren. And the weather cooperated--we went crabbing, hiked Neahkahnie mountain, saw the sunset and had a bonfire on the beach, went to the tide pools at Cannon Beach and saw surfers at Short Sands. Highly recommend this home. Emails were answered quickly and thoroughly! We wanted to add an extra to our stay and it was done within 24 hours which was so nice! We loved the house! The space and amenities were excellent. Our only concern was the driveway. The pitch was more than we anticipated so we scraped the bottom of our bike rack and had to back down the street to get out a few times. I had read that from another review so we were prepared. Other than that, we loved it. We hope to be back next summer. we've been vacationing in Manzanita for over 25 years, and have dealt with many different rental agencies. I'd put your company at the top of the heap. Exceptionally helpful, friendly, communicative and responsive. Your information guide is outstanding, and the checkout procedure is simpler and better than most of the other agencies. Well done! Loved the house. Since we only had 5 people in our group, it wasn't a huge problem, but would have been nice to have more than one shower in the house. Cleaner than most hotels I've stayed in! The rental orchestration was so easy -- great attention to detail on the part of the Rental Team. Great appreciation of the friendly welcoming emails containing complete arrival and departure information -- very professional. Very nice home, clean and comfortable.